Ever Think About Not Writing? I came across an article in The Guardian about the resurgence of independent book stores in the U.S.. While the piece was interesting and upbeat, a quote from bestselling author Judy Blume made my mouth drop open. Blume said that she wakes up every morning, looks at the sky, and thanks whoever’s up therefore for not having to write today. You can read the quote in the piece here. As you probably know, Blume is a highly successful author with millions of books sold. Why is she so happy that she doesn’t have to write anymore? No explanations are offered, which I suppose isn’t surprising, given that the piece is about her new venture as owner and operator of a nonprofit indie bookstore in Key West, Florida. I have some theories, though. First, let’s face it. Writing is hard work; draining, in fact. Also, when you have the body of work that Blume has, how much more do you have, or want, to say? Clearly, she has enough money to live on from her royalties. Perhaps boredom set in? Perhaps, she simply craved new challenges? She does state in the piece that she’s excited to be learning something new at age 78. Kudos to her for that! I think she also tapped into a feeling that many writers share. There comes a time when we wonder about packing it in. I know I have. Maybe that’s why her comment made me stop and think. Will I stop? If so, when? Do I have a specific time set in mind? The answer is not right now. The truth is that I still love writing. The other truth is that I haven’t achieved most of my goals yet. But when that happens, what then? Something to ponder, isn’t it? Do you ever think about not writing? Tell me…and please tell me why. I’d really like to know. I admit it. I’m slow to take good advice. For instance, writing colleagues often recommend great how-to books, yet it takes me ages to get around to reading them. 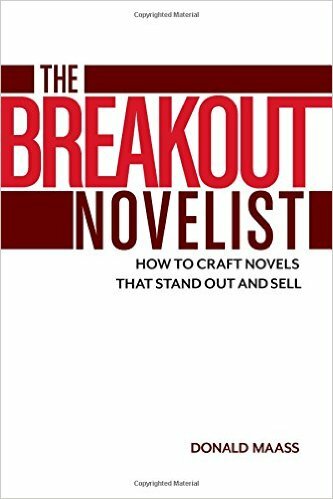 Several people have recommended books by Donald Maass over the years, so I finally took the plunge and read TheBreakout Novelist while preparing notes for an urban fantasy I’m working on. Honestly, the book was so inspiring that I found myself writing copious notes about my own novel regarding plot points, ramping up the tension, creating big moments, and so on. It’s been invaluable. On the other side of coin, I’ve been reading a fair bit of advice on marketing books. As mentioned last week, I will be doing more self-publishing over the coming months, so I’ve been looking for tips from those who’ve done it successfully. There are a number of great blogs on the topic, but the advice I want to focus on today is from Toby Neal, whose name I’ve heard everywhere. Her advice not only makes sense, but seems relatively easy to follow, and I recommend that self-publishers read what she has to say. A lot of her tips, such as building a fan base, gathering reviews, offering giveaways or sales, and maintaining a strong platform isn’t new, but Neal discusses something I’ve been pondering for a while, which is whether to place one’s books with Kindle Unlimited or choose multiple platforms. She discusses her own experiences and the benefits of both, and she’s a fan of Draft 2 Digital, the company I plan to use when I release my books. I may be slow to follow advice, but I’m also discerning about the advice I take. It’s important to figure out what works best for me. I have my own ideas about where I’ll publish my books and when, but it’s all part of the learning curve, right? We each have to follow our own path and, if we’re very lucky, we’ll be so successful that we’ll be creating trends rather than following them. I'm participating in Story A Day May again this year. I've completed the challenge for the past three years, and I hope to complete it this year, too. Well, it's fun, for one thing. I tend to write slowly and painfully, editing as I go, second- and third- and fourth- and ... let's say second-guessing myself at every turn. If I set my alarm for 6am and give myself until 8:30 or 9am to finish, I have to just whack the story out, making snap decisions and trusting my subconscious to do its job. I may not come up with the best possible story, given the materials I start with, but I come up with a finished one. As the boys say in ISHTAR, that ain't poverty. It's also useful this year: For my prompts, I'm cleaning out my office. I have various stacks of papers cluttering the place up, so I'm grabbing a handful and sorting them out, making a list every morning of what catches my fancy, and using the list to jump-start my brain. Another thing I'm doing this year is tying the stories to previous projects; I'm exploring characters' backstories, writing about people and places only mentioned or hinted at in my books, and adding short stories about short story characters people seem to like so I can put out collections of them. So how do you actually turn the prompts into stories? Get a prompt (one or more, just a word or a phrase or a concept). I'm using my messy office this year. Last year, I used spam comments from my blog. Julie Duffy, of Story A Day May, provides a prompt every day and has books of daily prompts. Work when you're least likely to be interrupted. Set a deadline to bulldoze your inner editor into letting you work with all the stops out. Give yourself permission to be a wackadoo. Have numbers always had personalities for you? That sounds like a story to me! Did you ever wonder what a cat is thinking when it jumps up and stares at nothing you can see? I already used that, but your story would be different from mine, so feel free. Enjoy yourself. If it isn't fun and it isn't improving your ability or refreshing your creativity, don't do it. Any of these writing challenges are for your benefit and for nothing else. If they don't benefit you, they're just pants that look better on the hanger than they look on your particular body type. To paraphrase Yoda, "Do or do not. There is no fail." If you'd like to see what I've been doing, follow this link to Marian Allen, Author Lady, Story A Day May to see this and all previous years' stories. Hope you have as much fun as I am! If all goes well, I’ll finally issue an ebook release of my favorite Alex Bellamy mystery, Fatal Encryption. The print version appeared in 2008. What took me so long, you ask? Well, a number of things. Back then, I spent a great deal of time finding reviewers and preparing a mail-out to hundreds of libraries here in Canada. I joined forums, launched a social network presence, and began blogging. I was also working on my Casey Holland mysteries and starting a new day job in security. Learning how to format an ebook was a daunting task, and in those days a number of start-up publishers were accepting ebook submissions. So I signed with an American publisher, a relationship that lasted for two or three years, but as neither of us were doing much marketing, few copies were sold. By 2010, I’d also signed a contract with another publisher for the Holland series, which resulted in publishing a book a year from 2011 to 2014. A colleague told me about Draft 2 Digital, a company that does ebook formatting in multiple platforms and only takes a small percentage of each sale. I’ve heard great things from others about D2D, so this is the route I’ve chosen for now. This week, I also came across an interesting piece by Chris Meadows who offers Kobo’s Mark Lefebvre’s thoughts on publishing pitfalls to avoid. The one that caught my attention, and which I’m still struggling with, is price point. Fatal Encryption is 370 print pages. Other than tweaking a word here and there, and updating my front and back cover information, it pretty much stands as is. I’m trying to decide whether to price the book at $1.99 or $2.99, or even higher? I don’t plan to write more Alex Bellamy mysteries, so it will be a stand-alone. So far, self-publishing gurus advise against charging $.99 for a first title, but I’m wondering what your thoughts are. All feedback is welcome, and stay tuned for the release of Fatal Encryption! When writers talk about guilty pleasures, it usually involves chocolate, ice cream, alcohol, donuts, book purchases, or simply taking time off to have fun. I know that writers are supposed to read and write a lot, and I do, but my creativity fades away after seven-thirty on most nights, and I save reading time for before bed. So, I was very happy to read a blog by Shaunta Grimes where she states if you want to be a writer, you should be watching TV. Genre writers, especially those writing contemporary fiction need to have a handle on pop culture from one year to the next. Tapping into issues people are talking about is important. Grimes is also quite right when she says that some of the best writing out there is happening on TV. Many of the stories are limited six or eight-part series. A entire season is only ten to thirteen episodes these days, which reflects the quick style of storytelling and diminishing attention spans that’s happened in North America. Watch the old Hawaii Five-O crime drama, then watch the new version and you’ll see what I mean. It’s certainly happening with books as well. Watching great TV is like sitting in on a great writing class. I think about what I’ve seen, ask myself why I like it so much. What’s drawing me back every week and why? How is the plot being constructed? Which twists didn’t I see coming? Terrific characters, intriguing plots, tremendous conflict, superb buildup of suspense and tension, and the need to find out what will happen next are crucial ingredients to both viewers and readers. In case you’re interested, here’s what hubby and I have been enjoying: Sons of Anarchy, Hell on Wheels, The Good Wife (one of the best written dramas I’ve seen in years), Madam Secretary, Banshee, Continuum, Haven, Penny Dreadful, Person of Interest, Rizzoli and Isles,. The Game of Thrones, The Blacklist, (some of the recent X-Files, although they could have done better). And, heavy sigh, I still miss Buffy the Vampire Slayer. When we want a break from drama, we mix it up with sitcoms like The Big Bang Theory, Veep, and Silicon Valley. As far as “reality” TV goes, we watch Gold Rush, Yukon Gold, the Voice, So You Think You Can Dance, and hockey (or at least my son and I do). Honestly, non-dramas are guilty pleasures. The other programs are homework. So, find yourself some compelling TV shows, then study them. You’ll be amazed at how many storytelling techniques can be incorporated into your own work. Anyone who’s published a book and is in promotion mode will quickly learn that life becomes a tricky balancing act. When you’ve published seven books as I have, and are becoming known in your own community, requests for favours and participation at events start to rise. For authors, spring and fall are our busy seasons where conferences, presentations, panel discussions, and awards ceremonies abound. Taking part in these while juggling writing, promoting, day jobs, family responsibilities, and illness can drain your time, energy, and motivation. So, how does one cope? Well, this year I’ve learned to say no. In 2015, I took part in eighteen events. Even with my part time job (which is five days a week) I discovered the hard way that it was too much for me. So, in 2016, my first event was just last week and I’ll have two more this coming week. This is enough for one season. I have six writing projects to finish, and writing is what I love most about this business. I’ve turned down at least three requests for my assistance/participation and two more potential marketing opportunities so far this year. It’s not easy to say no because part of me always feels that I should be doing more and constantly reaching out to my community. I enjoy helping others, and have a number of times, however I just can’t accept every request. Do I feel great about saying no? Absolutely not. But I would feel much worse, and resentful, if I said yes. I’ve kept asking myself how many times I can shove aside all the WIPS sitting right in front of me to do this or attend that? I might not be invited again to participate in whatever event I turned down. Odds are good that those who wanted to infringe on my writing time won’t be happy with me and—heaven forbid—will unfriend me on FB and Twitter. So be it. At the end of the day, we all have to make choices. This year, I’m happy with mine.